French President Emmanuel Macron, left, and his Chinese counterpart Xi Jinping attend a wreath laying ceremony at the Arc de Triomphe monument in Paris, March 25, 2019. Chinese President Xi Jinping has been treated to a sumptuous dinner near Nice and an official welcome by his French counterpart at the Arc de Triomphe in Paris — not to mention a 17th-century French translation of Confucius. German Chancellor Angela Merkel is welcomed by EU President Jean-Claude Juncker at the start of an emergency European Union leaders summit on immigration at the EU Commission headquarters in Brussels, Belgium, June 24, 2018. The French president has already set the tone, declaring Friday "the time for European naivete is over" — a sentiment echoed by fellow EU powerhouse Germany. 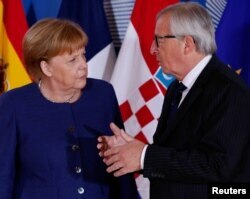 "We want a relationship based on reciprocity," Merkel said. "If one side has access, then the other side should, too." "If Paris, Brussels and Berlin are on the same page, it's not certain that everyone will follow them," France's Le Monde newspaper wrote. "Scandinavian countries are reticent ... those in the south — Italy, Portugal, Greece ... need Chinese investment." 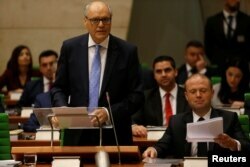 FILE - Maltese Finance Minister Edward Scicluna, flanked by Prime Minister Joseph Muscat, presents his government's 2019 budget at parliament in Valletta, Malta, Oct. 22, 2018. "One has to be wary of any country, especially with political ambitions or any sort of ambitions," Maltese Finance Minister Edward Scicluna told CNBC, "but that's life." Also described as the new “Silk Road,” China's strategy of infrastructure development and investments now spans more than 150 countries. Chinese yuan have helped to bankroll new trains, roads and ports around the globe — crucial additions, especially for developing nations, and key instruments to expand Beijing's economy and global leverage. Win-win deals — or are they? China calls the initiative a "win-win" deal. But critics note the infrastructure projects have indebted some African and Southeast Asian nations and rendered strategic assets, including ports in Djibouti and Greece, essentially under Chinese control. 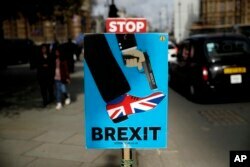 Brexit placards placed by anti-Brexit supporters stand opposite the Houses of Parliament in London, March 18, 2019. The European Union has drafted an official strategy calling on member states to pressure Beijing for greater accountability and transparency in its business dealings. Yet that might be undermined by another reality; China's effectiveness "at dividing and conquering EU member states by targeting them individually," wrote University of Bristol East Asia expert Winnie King in The Conversation. Francois Godemont, an Asia expert at the Montaigne Institute in Paris, believes Xi's priorities on this trip are not only economic, but also to "disarm" a skeptical Europe and further distance Brussels from Washington before more U.S.-Chinese trade talks next month. "Seen from China, trade deals are a footnote," he added in an interview Monday with France-Info radio. 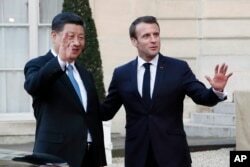 Another French analyst, Sylvie Kauffman, argues Xi's visit underscores a much bigger threat as other powers — including Russia and the United States — also seek to undermine European unity. "Europeans need more than a wake-up call," Kauffman wrote in the The New York Times. "They must decide whether they can contemplate the prospect of their continent being cut up piece by piece by competing bigger powers, or whether they want to regain enough collective strength and common sense to control their own destiny."